Discussion in 'Photography Forums' started by Tobers, Jan 12, 2008. I was putting the kids to bed last night (far too late too) and found my son playing with a strange squidgy ball with a blue light in it. Ah-ha! Photo opportunity! 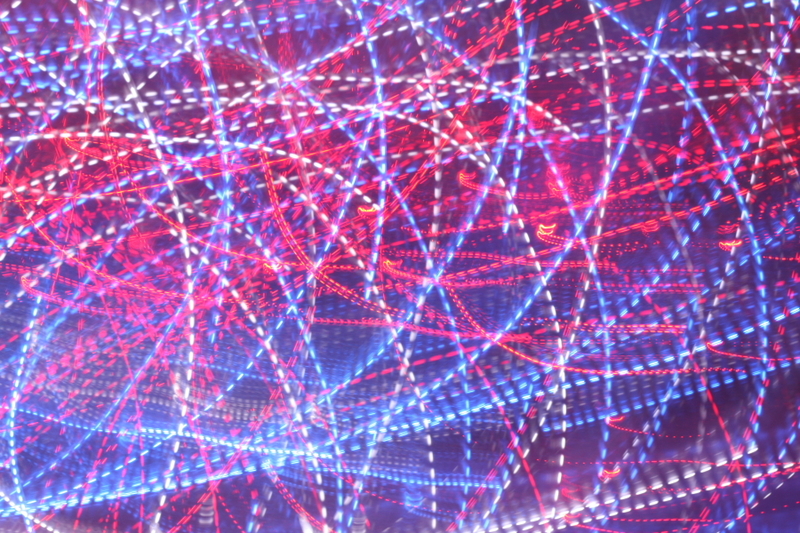 Camera on a tripod with Sigma 10-20 on it set to 11mm with no particular focus, aperture f4.5, ISO 640, 30 sec exposure. Turned the lights off, hit the shutter release, then threw the ball to each other. Funny as anything. I like this type of picture. On a similar vein here's one of several I did of the Christmas lights a few weeks back. I'd crop the right hand side off, you have some very dark space there and the overall composition and impact of the shot will be vastly increased by that action, it will also keep all of the focus of the eye more centrally positioned in the frame. The effect of the trails is also very random. If you could perhaps manage to throw the object both faster and straighter you might find that you get a more linear pattern. NOT to be taken seriously! !